If you are just starting out brushing your dog’s teeth, the first step will be to find an appropriate toothbrush and toothpaste. You don’t want to just grab what you use on your teeth, as our brushes aren’t designed to effectively clean your canine’s canines. Additionally, toothpaste made for people may have ingredients that would upset your dogs system. The brushes made for dogs will have softer bristles than may be available for use on people, and the toothpaste will be safe to use, and come in a flavor that will be more pleasing to your pet. Often, your local pet store will have a selection of brushes and toothpastes, though you may also want to check with your veterinarian for recommendations. The concept of getting their teeth brushed will seem strange to your dog, so it is best to use baby steps going forward. You will need to acclimate your dog to the idea of having their face and mouth handled, which can take some time on it own. Work up to running your fingers along their gum line until they are fairly non-reactive to the experience. Once they seem comfortable with being handled, introduce the brush and toothpaste slowly. Let them see and smell it. See if they will lick the toothpaste off of your finger. Just as people enjoy different flavors, it is possible your dog won’t care for the toothpaste you initially chose. You may have to experiment with a few flavors until you find one that they enjoy as this will make the brushing experience more pleasant for them. Now that your dog is familiar with the tools involved, place a small amount of the toothpaste on your dog’s toothbrush, and gently open their mouth. Angle the bristles towards the gum line at about a 45 degree angle to the teeth. Move the brush in soft circles, covering the gum line and entire surface of the tooth. You may need to work up to brushing the whole mouth, so focus on slowly increasing the duration until total brushing time is about 2 minutes, and covers the entire mouth. Once you are finished, be sure to reward your dog to encourage their future cooperation. This part should be enjoyable for you both. In an ideal world, you should brush your dog’s teeth daily, but this can be a challenge for many people. There are special treats and toys that are designed to help keep your dog’s teeth clean, so that can help during periods where brushing is not an option. 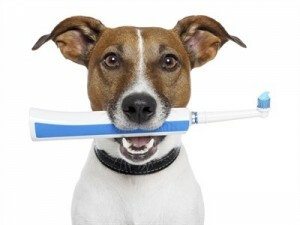 Just like we need to go to the dentist, be sure to schedule regular cleanings for your dog with the veterinarian. Happy dogs need happy mouths too.